PARIS — A small French pleasure craft with eight protesters on board left Greek waters overnight and set off for Gaza in an attempt to break an Israeli naval blockade, organisers said Tuesday. The “Dignite al Karama” is so far the only boat in a planned flotilla organised by pro-Palestinian activists to set sail from Greece, after the authorities there blocked other vessels from taking part in the protest. The 19-metre (63-foot) motor cruiser is carrying, among others, the former French far-left presidential candidate Olivier Besancenot, Green Party Euro-MP Nicole Kiil-Nielsen and trade unionist Annick Coupe. They expect to be off Gaza within an day or two, the group told AFP. “The boat was able to take on board fuel and food. It’s heading towards Gaza,” said Jean-Claude Lefort, spokesman for “A French Boat for Gaza”, the French wing of the international maritime demonstration. “We are going to send a delegation to the French foreign ministry to ask for protection. Depending on how that goes, we will advise on our progress,” he added. Israel has warned it will halt any vessels approaching Gaza. On Monday, Greek forces intercepted a Canadian boat carrying more than 30 Gaza-bound activists from Canada, Belgium, Italy, Switzerland and Turkey and forced it to moor in Crete. Scores of Palestinian children whose homes were destroyed during the Israeli war on Gaza at the turn of the year 2009 gathered at the fishermen pier in Gaza to condemn the Greek government’s decision to ban the departure of a flotilla of ‘aid ships’ from Greek ports to the Gaza Strip. Protesters accused the Greek government of doing Israel’s bidding. Video of “Louise Michel” the boat to Gaza, preparing to leave the port! La vidéo du Louise Michel qui se prépare à prendre la mer ! Canadian human rights activists gathered in the country’s capital on Sunday to support the Canadian boat to Gaza, which aims to deliver aid and bring attention to the suffering of the besieged people of Gaza. The Canadian boat titled the ‘Tahrir’ which means Liberation in Arabic, is part of a group of humanitarian aid ships from around the world called “Freedom Flotilla Two” which were blocked from leaving port on Friday by Greek authorities. Organizers say that even though Greek authorities are harassing the passengers on the Canadian boat to Gaza, however the Tahrir will set sail on Monday. We, Israeli organizations, Palestinians and Jews, declare our support for the Gaza-bound Freedom Flotilla and its declared goals: to break the Israeli siege on Gaza – both on the sea and land – which represents part of the ongoing Israeli occupation. We denounce the slanderous campaign of the government of Israel against the flotilla and its participants, and warn against the government’s use of these lies as justification for additional violent actions against the participants of this legitimate political protest. The flotilla to Gaza is a brave act of political protest, which expresses solidarity with the Palestinian people and the opposition throughout the world to Israeli occupation policies, the ongoing siege on Gaza and the collective punishment of civilians. Today the Gaza Strip is a massive prison for its 1.5 million residents, for whom basic rights are denied. The right of the Palestinians in Gaza to maintain direct contact with the outside world, their right to open their port, their right to receive and send ships, their right to import and export goods and to develop their economy, precisely as for Israel these rights exist. The state of Israel must end its direct and indirect control over the Gaza Strip, as part of its obligations grounded in international law and to end its occupation regime over the Palestinian Territory and to permit the independence of Palestine. We denounce attempts of the government of Israel to create an atmosphere of fear of the flotilla and to discourage participation in it. 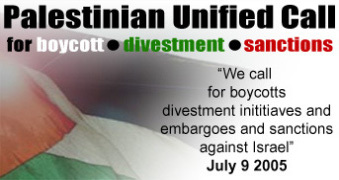 The government of Israel wishes to create an unfounded atmosphere of fear through knowingly spreading lies about the so-called preparations for violent resistance to kill soldiers, and the intention of peace activists participating in the flotilla to bring weapons with them to Gaza; in parallel, it is exerting unprecedented pressure on international journalists, lest they join the flotilla in order to cover it. This media campaign, intended to sow fear and hatred in the Israeli public, further arouses suspicion that an additional goal is to justify the harsh and dangerous results which are liable to occur in case of a violent takeover of the ships and harm to their passengers. We strongly denounce the decision of the government of Greece to bar departure of the vessels from its ports to Gaza. This decision contradicts international laws concerning freedom of navigation, and is tinged with extreme unreasonableness. From reports in the media about the contacts between the governments of Israel and Greece, the impression is received that Greece is succumbing to unacceptable political pressures from the government in Israel. We call on the Greek government to immediately annul the order prohibiting sailing of the flotilla vessels from its ports and to allow their departure whilst ensuring the safety of the passengers and ships. We call on Israel’s government and security forces to permit the ships to enter Gaza and unload their humanitarian cargo in peace, and hope the ships arrive safely to their destination. We call on the government of Israel to immediately end the siege of Gaza. A Jordanian union leader told Agence France Presse that a boat has been purchased for $800,000 in Greece to carry construction materials, medical supplies, and 200 additional passengers to join the Gaza Freedom Flotilla of ten ships and several hundred passengers from 20 countries. The Flotilla, which was scheduled to depart last week, is currently being delayed by Greek authorities. The 200 additional passengers will make up for some of the 500 Turkish aid workers who had planned to take part in the Freedom Flotilla to Gaza on the Mavi Marmara ship, but were prevented from doing so when the Turkish aid organization sponsoring the ship pulled out of the trip due to unnamed ‘technical reasons’. In addition to the loss of the Turkish ship, two of the boats planning to take part in the Flotilla were damaged by Israeli divers who cut through the boats’ propeller shafts. The crew of the two boats in question claim that the similarities in damage on the two boats indicate acts of deliberate sabotage. Over 300 activists are still planning to travel to Gaza on the Freedom Flotilla, and the new boat will increase their numbers to over 500. The boat is sponsored by a new organization called ‘Noor’, which means ‘Light’ in Arabic, made up of participants from around the Arab world who collectively donated over a million dollars to ensure the Flotilla’s success. 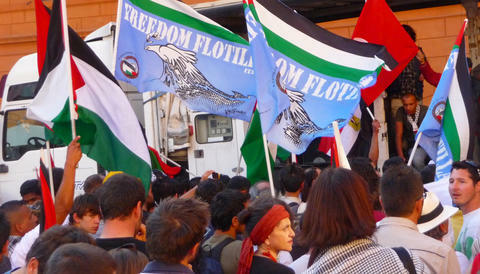 The Freedom Flotilla, currently delayed in Greek harbors, aims to break the Israeli naval blockade of the Gaza Strip and bring attention to the plight of the civilian population there. The 1.5 million people who live in the Gaza Strip, half of whom are children, face daily electricity blackouts, heavily salinated and polluted water, and frequent sewage overflows due to the Israeli blockade preventing imports of much-needed fuel and supplies. Wael Saqqa, a representative for ‘Noor’, said that 35 Jordanian activists would be part of the newest addition to the Flotilla, along with representatives from other Arab countries. US activists, stopped on their way to Gaza, have held a vigil outside the US embassy in Athens to protest against the government’s green light to Israeli attacks on aid-for-Gaza activists, a peace activist says. The campaigners demand that Washington reverses a statement that is “essentially giving Israel the green light to attack this non-violent task force with violence,” Ken Mayers, US Peace Activist in Athens told Press TV. Mayers explained how their stay in Athens was met with acts of sabotage against two of their boats as well as delaying tactics to keep them on shore, perpetrated by Israeli elements and political pressure. The ban comes as organizers of the humanitarian aid flotilla to the Gaza Strip say that the Tel Aviv regime is making Greece halt the convoy. The voyage “is a non-violent” attempt to protest against the injustice that the Israelis are inflicting on Palestinians, Mayers said. Israel has ordered its navy to use all possible means to prevent the incoming international aid flotilla from reaching the Gaza Strip. Some 1.5 million people in Gaza have been denied their basic rights, including the freedom of movement and the right to appropriate living conditions, work, health and education since June 2007 after Hamas took control of the enclave.